Figuring out that your roof is in need of a repair or complete replacement is as important as it is tricky. With all the chores and commitments we face throughout the day it’s rather easy to forget that even the roof needs maintaining and regular check-ups. There are numerous factors that could potentially damage the roof and speed up the deterioration process. Some of these factors include inadequate roof installation, natural elements such as the sun, rain and snow and even old age. For those unsure on whether their roof needs a repair or a complete replacement, here are 5 signs to look out for. Damaged and cupping tiles can be noticed from a mile away. Loose tiles, on the other hand, are easy to miss unless you’re purposely looking for them. 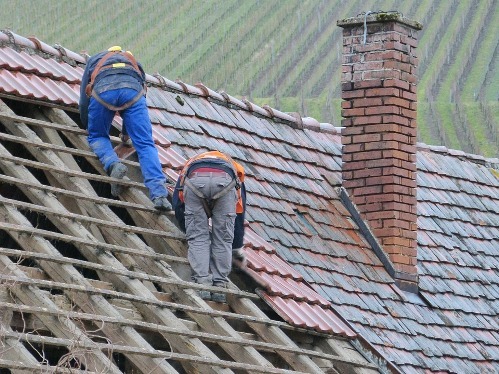 This is why it’s important to check for any loose tiles when inspecting the roof. Wobbly tiles could easily turn into loose tiles or end up completely missing. Once you’re up there, walk around the roof and wiggle the tiles with your feet or put on some construction gloves and check it by hand. If you notice any movement whatsoever, your roof is in need of a repair. If you happen to spot mold on moss growing on your roof, this could potentially mean two things. The roof tiles have either started to degrade and rot, or there’s excess moisture on or inside the roof. As moss is growing, it forces the tiles apart. This creates a gap in your roof which can potentially let water in and cause extensive leakage. Both of these scenarios are fairly common in places with high precipitation and if you live in such a place, it is best to check the roof at least a couple of times a year. One of the best ways to check for leaks, other than water-stains covering the walls, is to visit the attic. Smelling mold and wood stains are the best indicators that there’s a leak somewhere in the roof. However, finding damp patches doesn’t necessarily mean that you’re experiencing leakage and water damage. They could easily be the result of hot, damp weather and increased moisture in the room. Water stains are a telltale sign of water leaking somewhere and an excellent indicator that your roof is in need of an urgent repair. Just remember that water flows and just because the leak is in a certain location, doesn’t mean that the roof is damaged at that same location. The outlines of your roof must always follow a straight line. If the roof has a saddle back or you notice that is sags around the middle, this is strong evidence that your roof has suffered significant structural damage. It must be taken care of immediately, as this type of damage could lead to your roof collapsing and endangering yours and the safety of those around you. The best way to prevent a roof from sagging is to use quality materials and once it’s finished installing, check the amount of weight it can tolerate. A properly installed roof could potentially last you 20 or more years. How long your roof will last is determined by type and quality of materials used in the build, how well it was made and how often it is maintained. Another factor to consider is whether you installed a single layer of shingles or you have multiple layers. Let’s not forget about the weather, which takes the biggest toll on your roof and ages it prematurely. Roof Repairs Sydney experts recommend that no matter what type of materials was used, any roof older than 15 or 20 years needs to be checked by a professional service. Regularly checking your roof for any structural damage is important, as it allows you to gradually repair the problematic parts instead of having to a complete replacement. Unfortunately, most homeowners call in the professionals only when they observe a major leakage. By the time they’ve noticed and reacted to the leak, their roof has already suffered substantial damage. And roof replacement isn’t something that can be done in one day, let alone without burning a hole in your back pocket. This is the main reason why you need to be on a lookout for certain signs that your roof needs repair. Whether it's loose, damaged or missing shingles, mold and moss growth covering the roof or water running from the ceiling, all these are telltale signs that you should consider roof repair. Some repair work could easily be DIY-ed with some new shingles and a couple of handy tools, but there are situations which may require calling in the professionals. Once it’s repaired, make sure to inspect and maintain it regularly.